The 2016 Beetle Dune features new and tougher looking front and rear fascias and black wheel arch extensions. Volkswagen officials hope that a high–performance Golf hybrid concept with more horsepower than a Ford Focus RS and two special-edition Beetles coming next year will quiet some of the chatter over its emissions scandal this week at the Los Angeles auto show. VW is showcasing an updated version of the Beetle Dune, which takes styling cues from the off-road Baja Bugs popular in the 1960s and 1970s in California. VW has dangled Beetle Dune concepts before but promises the latest version will be built starting next year in coupe and convertible models. The Beetle Dune will be offered as a coupe and convertible, and can be ordered starting November 19. Prices in Germany begin at 23,625 euros for the coupe and 27,800 euros for the cabriolet, VW said in a statement. The Beetle Dune gets new and tougher looking front and rear fascias and black wheel arch extensions. The Dune, powered by a 180-hp 1.8-liter gasoline turbo four-cylinder, also get a few chassis changes. The track -- the width between the wheels -- is 0.6 inches wider and the ride height has been increased 0.4 of an inch over the standard Beetle. The interior gets special seats, and its infotainment system has a 6.3-inch screen with a capacitive touch sensor, so it works much like a cellphone or a tablet. 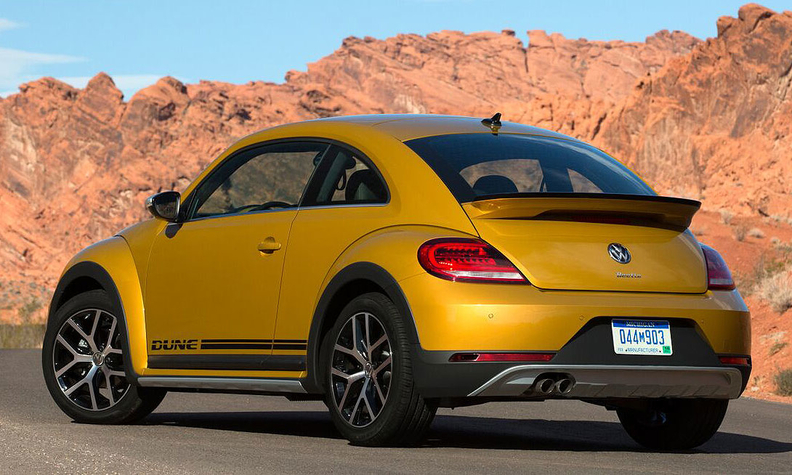 VW says the Beetle Dune will be available in yellow, white or black. “The new Dune successfully captures the iconic spirit of Baja Beetles, with a more rugged feel and amenities never before offered in a third-generation Beetle,” said Joerg Sommer, Volkswagen of America’s vice president of product marketing and strategy. VW will also unveil a second special Beetle, the Denim, which is a limited-run model that pays tribute to the Beetles of the 1970s that had special interiors and other trim. The Denim’s redo is all cosmetic, but very thorough. The convertible version features a dark blue top with textured fabric that looks like denim. Inside, the dash pad is light blue and silver. The seats sport light blue, denim-colored cloth with white piping and blue accents. They have small pockets with red tabs. The engine is a 1.8-liter gasoline turbo combined with a six-speed automatic transmission. VW says it is building only 2,000 Beetle Denims, which arrive early next year. No prices have been announced for either Beetle. The swoopy Golf GTE Sport, a concept that VW has shown several times this year in Europe, could indicate one direction VW is considering for the boxy Golf hatchback. VW says it “blurs the lines” between motorsports vehicles and road cars. 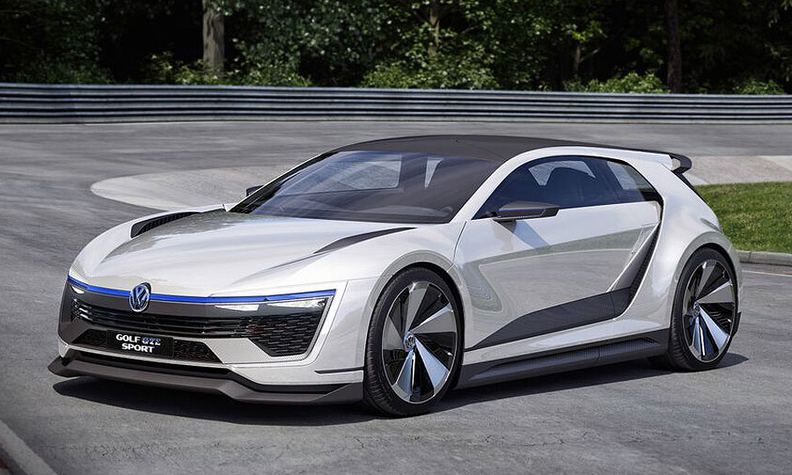 The third L.A. show car is the Golf GTE Sport, a concept that VW has shown several times this year in Europe. The swoopy coupe could indicate one direction VW is considering for the boxy Golf hatchback. VW says it “blurs the lines” between motorsports vehicles and road cars. Power is generated by a 1.6-liter turbo four-cylinder gasoline engine and two electric motors, one in the front of the car and one in the rear. Total horsepower is 395 and 494 foot-pounds of torque. VW says the car can accelerate to 60 mph in about 4 seconds, hit a top speed of 174 mph and, when driven on the European test cycle, delivers 118 mpg. The Golf GTE Sport’s body is made of carbon fiber.